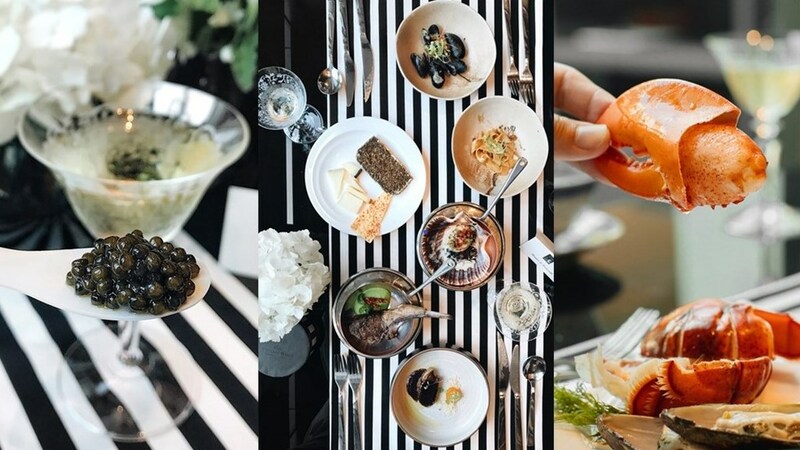 Bangkok, Thailand, 2019-Apr-11 — /Travel PR News/ — Brasserie Europa’s new Black & White Sunday Brunch celebration includes the welcome addition of the elegant vintage Blanc de Blancs Champagne. Guests choosing Brasserie Europa’s Champagne Sunday Brunch that are either wearing white or carrying white accessories can now enjoy a fabulous complimentary upgrade to our vintage Blanc de Blancs Champagne. Early birds and latecomers alike have all the time to celebrate the weekend with family and friends over free-flowing champagne, wines and cocktails, caviar tasting paired with a hand-poured glass of premium German vodka and smooth jazz. The extensive buffet choices include light appetisers and salads; quality fresh seafood such as Canadian lobster, three kinds of oysters, Alaskan king crab and New Zealand mussels; and international cheeses, cold meats and homemade bread. Guests are also treated to bite-sized pass around samples of dishes selected by the chef and a “Martini” trolley, where the house mixologists prepare a selection of decadent martinis’ to choose from, all prepared right in front of you. Sunday Brunch also features à la carte main courses cooked to order and served at guests’ tables. Choices include Hokkaido scallops served with squid ink barley, lemon zest and chorizo chips; Wagyu beef medallion “Rossini style” served with foie gras and sautéed spinach in mushroom sauce; and Murray lamb cutlet with mint pea purée and sweet crispy chili. The carvery station at Brasserie Europa serves succulent cuts of premium meats and super-fresh seafood with condiments for those with insatiable appetites. “We invite diners to spend an enjoyable afternoon in the comfortable atmosphere of Brasserie Europa sipping on fine Blanc de Blancs champagne and enjoying unlimited, freshly-shaken cocktails, wines, beers and fresh juices. Join us for a celebration of the weekend in fine style and share memorable moments with family and friends” adds Andreas Magnus. The beverage packages are designed to meet the demands of all local and international guests, starting from THB 2,900++ per person including free-flow soft drinks. Children aged 6 to 12 years pay THB 1,450++. The free-flow Champagne package with other alcoholic beverages is priced at THB 4,900++ per person with the complimentary upgrade to Blanc de Blancs Champagne available to all diners wearing white clothing or carrying white accessories. This entry was posted in Business, Food & Drinks, Hotels, Luxury, Resorts, Travel, Travel Management, Travel Services, Travelers and tagged Andreas Magnus, Black & White, Blanc de Blancs, champagne, Kempinski, Sunday Brunch. Bookmark the permalink.